Caregivers have little spare time for themselves. 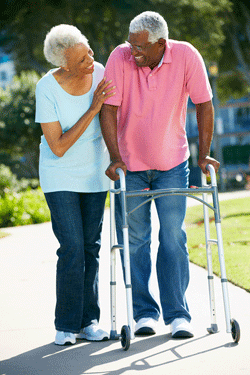 If you are a caregiver, exercise may feel like the last thing you want to do with free time. But choosing to exercise may keep you from getting sick, give you more energy and help you sleep better. Many caregivers also know the feeling of being depressed by the relentlessness of the situation. Exercise can help with this, too. Being healthier makes you a better caregiver and a happier companion. Taking a walk is the simplest activity you can choose and it is a great way to refresh physically and mentally. Exercise is one of the most important things a stroke survivor can do to help avoid another stroke and live a life with fewer acute stroke-related incidents. A successful exercise program takes dedication and commitment. Developing a fitness partnership or buddy system between survivor and caregiver helps ensure success and benefits everyone. Learning the basics of a fitness program is very straightforward and no one knows a stroke survivor's limitations as well as the caregiver. Do the exercises together to encourage and inspire each other. Many exercises are more effective when done with a partner. Assisted stretching helps muscles move into maximum range of motion. Weaker limbs can become stronger with assisted strength training. Add brain and communication activities to your buddy workouts. Alternate saying the next letter of the alphabet. Count by 5s forwards and backwards as you do repetitions of an exercise. Sing a song that corresponds to the activity. Doing rows to work the back? Sing Row, Row, Row your Boat. Singing helps regulate breathing. Have you found an activity that works for you? Please tell us about it. You will be helping other stroke survivors!